Hello internet! I am typing this on my phone during the second day of the design conference I'm photographing, the reason I've been fairly absent from the interwebz this week. So, apologies if I am less verbose than usual, and stuff. Note: now it's after 11pm and I just got home. Time to finish this. This week's flag actually came to me because I was thinking about a similar type of country's flag—a flag that, unlike this one, I absolutely hate. Both are tropical island nations, and both are so beautiful that they certainly deserve to have beautiful flags. The flag that really misses the boat (in my opinion) belongs to the Maldives; the flag I adore, above, is from the Seychelles. I love this flag because its loud, proud and bold. The stripes emanating from the lower left diagonally upward implies upward & onward positive movement/action, or even a message from the people toward the sky/world, and the pan-African colors unite this island country with its related continent. Cool things about Seychelles: first, their society is matriarchal (cool!). The French claimed the islands in 1756 but lost control to Britain after the Treaty of Paris. The islands have no indigenous people, but immigrants over time have created a creole-type population. 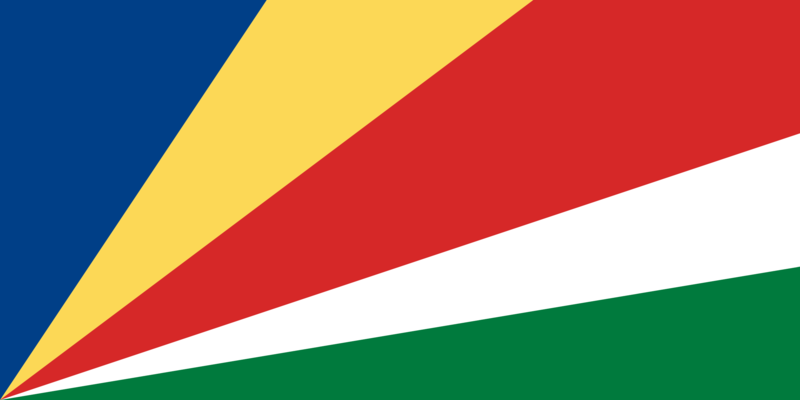 The closest country to Seychelles is Madagascar, which means Seychelles is located in the southern Indian Ocean. The oblique bands symbolise a dynamic new country moving into the future. The colour blue depicts the sky and the sea that surrounds the Seychelles. Yellow is for the sun which gives light and life, red symbolises the people and their determination to work for the future in unity and love, whilst the white band represents social justice and harmony. The green depicts the land and natural environment.